Whether you’re a BuzzFeed fan or aim to avoid meme-filled listicles at all costs, you can’t deny the platform’s success. In a noisy and overcrowded digital world, BuzzFeed managed to break through, find an engaged niche and become a household name in online media. BuzzFeed didn’t leave its success up to chance, though. It wasn’t because of cat memes, either – although they certainly didn’t hurt. So what is it then? What’s so special about BuzzFeed’s approach to content creation? BuzzFeed content is fun, voicey and quirky on purpose. The platform found an audience in younger generations, catering to them by sharing the relatable content that speaks their lingo. The content plays on nostalgia, slang terms and social trends that appeal to younger viewers. Somewhat more importantly, it does so in a way that feels genuine to that audience. While BuzzFeed articles aren’t strangers to going viral, your first goal doesn’t have to be getting famous overnight. Your focus should be on getting to know your audience and figuring out how you can create content that suits their preferences and answers their questions. With a savvy keyword strategy, you can make your way to page one search rankings – which in itself feels like a little rush of fame. BuzzFeed is probably most famous for its less traditional forms of content, especially listicles and quizzes. 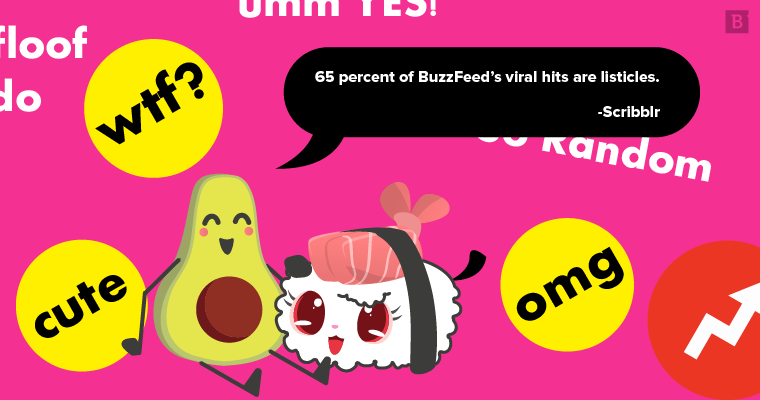 In fact, in an analysis of BuzzFeed articles, Scribblrs found that 65 percent of the site’s viral hits are listicles. These short articles work well because they answer consumer questions in a simple, easy-to-scan format. They’re also usually accompanied by GIFs, memes or other visuals that add a few laughs to the experience. We’re not saying all of your content has to be in a listicle format, but there’s something to be said for 1) publishing easily digestible content and 2) experimenting with different content types and formats. There’s something to be said for 1) publishing easily digestible content and 2) experimenting with different content types and formats. No matter the topic or format, BuzzFeed’s content stays at a steady elementary reading level – and it’s not because BuzzFeed thinks its readers have limited vocabularies. The content is written that way so a wide range of audiences can digest the information quickly, which appeals to shrinking attention spans. The lesson here is not to dumb down your content, but to write with your audience in mind. Make sure the readability of your content matches not only their level of education but also their needs and preferences. Yet another well-known characteristic of BuzzFeed content is the headlines. Sometimes clever, other times downright cheesy, they’re always written to entice viewers to click. The catchy headlines align with the BuzzFeed voice, giving viewers an accurate portrayal of the kind of content they’re getting themselves into. While a BuzzFeed headline may not be appropriate for your content, click-worthy blog titles are rewarding for any brand. The catchy headlines align with the BuzzFeed voice, giving viewers an accurate portrayal of the kind of content they’re getting themselves into. Not trying to be nauseatingly meta here, but BuzzFeed does an impressive job creating content that fits seamlessly in the interweb. It’s made for how viewers consume content, meaning both desktop and mobile experiences meet user expectations. Plus, BuzzFeed content is extremely shareable, which is why it’s always trending. When it comes to advertising revenue, BuzzFeed doesn’t always settle for traditional ads. Instead, the company publishes branded content that looks and feels like a BuzzFeed article, except it’s sponsored by another company. This native marketing feels natural and transparent, and still provides viewers with the content they expect from BuzzFeed. The idea here to maintain a modern, relevant edge at all times. If sponsored content isn’t quite right, try other influencer marketing tactics to increase your reach while still providing your audience with useful and engaging content. Newsflash: A lot of what Buzzfeed publishes isn’t actually content its employees created from scratch. They’re great at aggregating existing content, compiling lists of humorous tweets, sharing photos of celebrities and creating commentary around trending news articles or social posts. What does that mean for you? Not everything in your calendar has to be original content. There’s a lot of value in content curation and repurposing your content for several different uses and platforms. What’s more, you can lean on your audience for the user-generated content that gives your marketing strategy a boost. BuzzFeed is a prime example of a content creator that doesn’t let the strategy go stale. The company continued to innovate and modernize, listening to its audience as it worked to continually deliver what they wanted. BuzzFeed excelled in reaching the Millennial audience, for instance, but those readers are growing up. If BuzzFeed wants to continue to engage those viewers, the platform has to grow with them. Hence why the company introduced video content to its repertoire and experimented with political topics and news coverage. In this case, following in BuzzFeed’s footsteps means continually testing new approaches and engaging your audience with fresh content. As long as you’re always improving, you can keep up with your audience. Understand your target audience well enough to speak their lingo. Mix up the type of content in your marketing calendar. Don’t settle for low-quality copy and visuals. Create content with both the end-user and platform in mind. Always look for ways to do better. There’s inspiration in any content creator’s success. What’s more important is what you take away from those examples – and the personal touches you add to create your own victories. Stevie Snow is a writer at Brafton. Yes, she is named after Stevie Nicks. She’s a believer in "to life, to life, l’chaim!" because life is what brings us the Obamas, a really smooth vodka tonic and that moment on the dance floor when your favorite banger plays.